Currently listening to Ed Sheeran's song Thinking Out Loud on repeat....this maybe my 7th time replaying it today. It's one of my all time favorite songs. I honestly cannot get enough of it because it's just so beautiful. I'm also bundled up because I'm trying to comfort myself after walking through today's 40 mile per hour winds. Yes, you heard me right. It's that kind of wind where once there's a gust in your face, you can't breathe. So much for doing blog pictures today....ugh and I got all dolled up too. So, since I want to FORGET about this weather, and since spring break it upon us, I wanted to give you guys some fashion picks that you need in your suitcase. I've said this many times before, but I'm a huge fan of nautical clothes, so of course I had to throw in a blue and white striped shirt. This off the shoulder striped shirt is a big hit recently, and I couldn't be more happy. I'm secretly fan-girling over the bows. Belle sleeves are my favorite because they add so much "drama" to an outfit. For that reason and for the fact that I love the print, this dress would make the perfect beach coverup, The front dips nice and low so your swimsuit will peak out. Yes another off the shoulder top with belle sleeves, but I could't resist this palm and flower print. Just picture yourself rocking this with a floppy hat and big sunnies on the beach. Okay, I know what you're thinking...That's a little loud and I don't want to look like a bumble bee. But I honestly kind of like it. 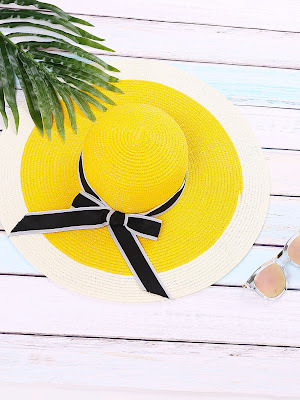 How cute this bow hat would it be with a black retro swimsuit. Here's another strappy swimsuit but definitely a different vibe. Just like everyone else, I'm a huge fan of the banana leaf print. It reminds me so much of islands and just makes me want to go on vacation. I would buy everything in this print if I could. Plus it's also super trendy since it's a one piece. Best of both worlds. Me encanta la colección. Muy chula la foto del principio! Your photos are so pretty! Beautiful floral selections for spring too! I am obsessed with that striped shirt. SO cute. Can't wait for summertime! <3 Nice picks! I love that song too! I hope it gets warmer for you soon. Love all of these picks, obsessing over that palm print swimsuit! Sunny days sound awesome right now! I love that hat! I need it! I'm also obsessed with Ed Sheeran's latest album. Pretty selection, I love bell sleeves! That photo of you on the beach is just so pretty! Loving all your Spring picks too! haha It is a pretty good song mind you! Love the banana print one piece! Its super cute and makes me long for summer! Ugh, I hate when I get dressed up for blog pictures and the weather doesn't cooperate. These are fun pieces. I'm loving your picks, girlie, they're perfect for spring and summer and have me all the more anxious for the start of the season! Thanks for sharing and have a great weekend ahead! 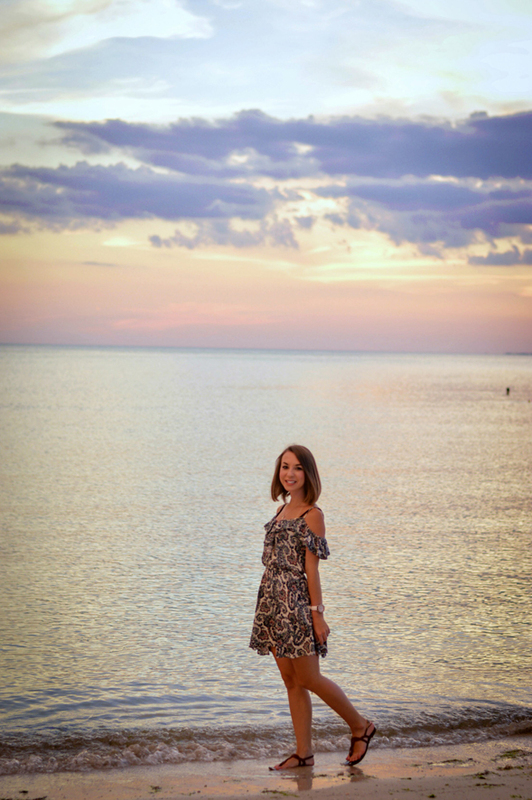 Such a pretty shot by the beach and I love your picks too! It's one of my favorite shots from my summer vacation. I love that palm print swimsuit! I love your dress! Awesome print and beautiful pics Kate! That Ed Sheerhan song is the best! Love your dress and your OTS picks - can't get enough of them. I also want that banana leaf one piece. So cute! I want it for myself as well! What a lovely selection! I love the dress you're wearing on the 1st photo! I think it's perfect for spring! I love that it's such a big trend now! Such a cute picture at sunset, your hair looks amazing in that pic too! 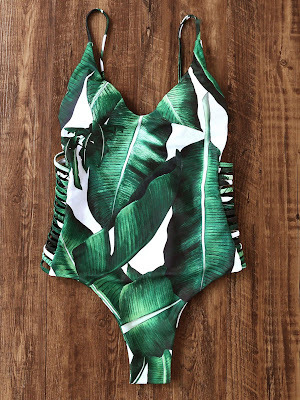 My favourite pick, hands down, is the green leaf print swimsuit. Can it be summer already, pleaassseee??? Why thank you; you're so sweet! 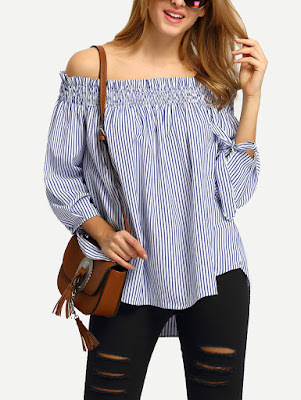 Off shoulder striped shirt is amazing.